P. Patel, W. Pittayakanchit, M. Son, A. Murugan, S. Tay. "Stochastic Resonance of NF-kB in Living Cells", submitted. M. Fatih Abasiyanik, Hoang Van Phan, K. Wolfe, J. Lin, B. Patel, B. Laxman, S. R. White, P. Verhoef, G. M. Mutlu, S. Tay. "Ultrasensitive digital quantification of cytokines and bacteria predicts sepsis outcomes", under review, Nature Communications. J. Lin, C. Jordi, M. Son, Hoang Van Phan, M. Fatih Abasiyanik, L. Vistain, N. Drayman, S. Tay. "Ultra-Sensitive Digital Quantification of Proteins and mRNA in Single Cells", in revision, Nature Communications. N. Drayman, P. Patel, L. Vistain, S. Tay. "Single cell analysis reveals viral hijacking of developmental pathways", accepted, eLife. P. Dettinger*, T. Frank*, M. Etzrodt*, N. Ahmed, A. Reimann, C. Trenzinger, D. Loeffler, K. Kokkaliaris, T. Schroeder, S. Tay. "Automated microfluidic system for dynamic stimulation and tracking of single cells". Analytical Chemistry, 2018, DOI: 10.1021/acs.analchem.8b00312​. ​C. Albayrak, S. Tay. "Single-cell interrogation of the immune system using microtools." Encyclopedia of Cell Biology. Ed. R.A. Bradshaw, Ed. P. Stahl. Elsevier, 1: 667-676 (2015). 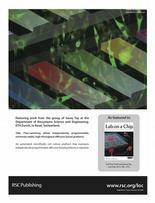 Article featured in the Lab On a Chip 2014 Most Accessed Articles collection for being one of the 30 most downloaded articles of 2014! Ranked "exceptional" by Faculty of 1000 Biology, and was covered by "The Seven Stones" EMBO, Biotechniques.com, and many others. This paper was covered by: CNN, Discovery Channel, National Geographic, BBC, NPR (National Public Radio), Photonics Spectra, Chemistry World, Physics World, Photonics Spectra, New Scientist, ABC News, Photonics.com, Daily Telegraph, Nikkei Newspaper, Optics.org, MIT Technology Review, Materials World, Laser Focus World, Die Welt, The Herald, IEEE Spectrum, Science et Vie and many others. S. Tay, N. Peyghambarian, "Updateable holographic 3D displays based on photorefractive polymers" (Invited). Society for Information Display, 24, 07, (2008). N. Peyghambarian, S. Tay, P. Blanche, R. Norwood, M. Yamamoto, "Rewritable holographic 3D displays" (Invited) (Cover article). Optics and Photonics News (2008). P. A. Blanche, S. Tay, P. St Hilaire, R. Voorakaranam, J. Thomas, C. Christenson, R. A. Norwood, M. Yamamoto, N. Peyghambarian. "An updateable holographic display for 3-D visualization" (Invited). IEEE Journal of Display Technology 4, 424 (2008). S. Tay, J. Thomas, B. Momeni, P. Hotchkiss, M. Askari, S. Jones, A. Adibi, S. R. Marder, R. A. Norwood and N. Peyghambarian, “Planar photonic crystals infiltrated with nanoparticle/polymer composites.” Applied Physics Letters, 91, 221109 (2007). ​P. D. van Voorst, M. R. de Wit, H. L. Offerhaus, S. Tay, J. Thomas, N. Peyghambarian, K. –J. Boller. "Holographic injection locking of a broad area laser diode via a photorefractive thin-film device." Optics Express, 15, 17587 (2007). ​M. Eralp, J. Thomas, S. Tay, G. Li, M. Yamamoto, A. Schulzgen, R. Norwood, N. Peyghambarian, “Efficient photorefractive polymer operating in reflection geometry.” Optics Express, 15, 11622 (2007). ​S. Tay , N. Peyghambarian, “Photorefractive polymers and their applications in photonics” (Invited) Sigma Journal of Engineering and Natural Sciences, 2005/4, Yildiz Technical University Press, Yildiz-Istanbul (2006). M. Eralp, J. Thomas, S. Tay, G. Li, A. Schulzgen, R. Norwood, M. Yamamoto, N. Peyghambarian, “Submillisecond response of a photorefractive polymer under single nanosecond pulse exposure.” Applied Physics Letters, 89, 114105 (2006). J. Thomas, M. Eralp, S. Tay, M. Yamamoto, G. Li, R. Norwood, S. R. Marder, N. Peyghambarian, “Photorefractive polymers with superior performance.” Optics and Photonics News, December (2005). S. Tay, J. Thomas, M. Eralp, G. Li, S. Marder, G. A. Walker, S. Barlow, M. Yamamoto, R. Norwood, A. Schülzgen and N. Peyghambarian, “High performance photorefractive polymer operating at 1550 nm with near video-rate response time.” Applied Physics Letters, 87, 171105 (2005). G. Li, M. Eralp, J. Thomas, S. Tay, S. R. Marder, A. Schülzgen, R. A. Norwood and N. Peyghambarian, “All-optical dynamic correction of communication signals using a photorefractive polymeric hologram.” Applied Physics Letters, 86, 161103 (2005). S. Tay, J. Thomas, M. Eralp, G. Li, B. Kippelen, S. R. Marder, G. Meredith, A. Schülzgen and N. Peyghambarian. “Photorefractive polymer composite operating at the optical communication wavelength of 1550 nm.” Applied Physics Letters, 85, 4561 (2004). M. Eralp, J. Thomas, S. Tay, G. Li, G. Meredith, A. Schülzgen, N. Peyghambarian, G. A. Walker, S. Barlow, and S. R. Marder, “High performance photorefractive polymer operating at 975 nm.” Applied Physics Letters, 85, 1095 (2004).